As the French River braids and splits apart in its descent to Huron, the Voyageurs always went west. They gave up broad channels, forsook direct routes, ignored ease and speed for narrow, winding passages and shallow paths because they knew Huron waited, big an open, like an ocean, like a slumbering giant that would wake with the wind. 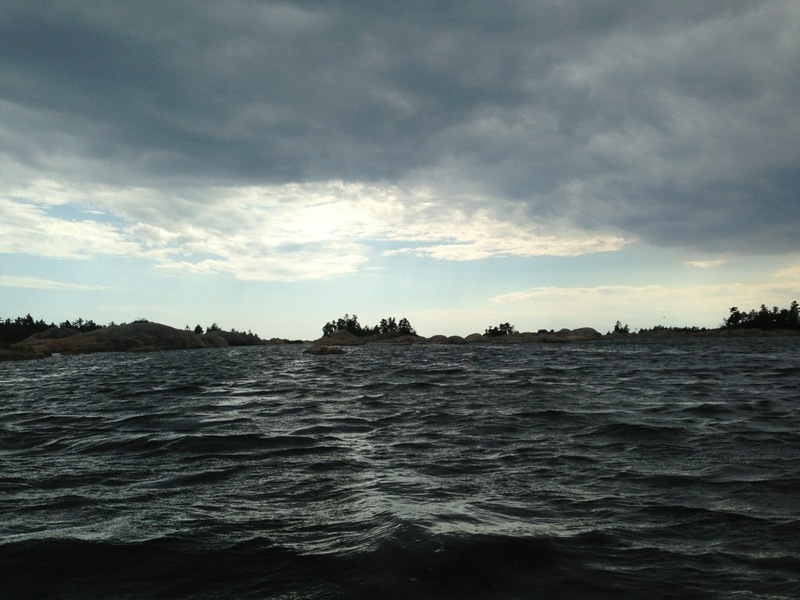 The breeze only whispered against my cheek as I slipped through the thousand granite islands at the edge of the French River. The water barely moved, just ripples breaking the glass and glittering in the sun, but the wind came, building from that faint exhale into a full breath of air, pushing from the west. The water rose with the wind, spilling up, rising into peaks and troughs, slapping at the granite rocks, sliding over them, splashing into the narrow channels, curving around islands. The wind only grew bolder, gaining every moment, building the lake into a mad ocean. I hid and darted between islands. I snuck through small cracks and winding channels. I pushed out around points, refusing to stop, popping up and down like a cowboy on an unbroken horse, my knuckles white along my paddle. Then I looked around at the chaotic sea, foaming at the mouth, alive and furious at my presence. “Get out,” it shouted and I listened in a moment, turning toward the nearest gap of rock, slipping through and away, punched back into the maze of granite, into the deep bays where the water barely moves and the giant can only claw at the edges. I dragged the boat onto a warm slab of rock and sat there in the sun, listening to waves crash in the distance and watching the afternoon drift away, showing my respect in the only way the lake demanded, by standing still. Posted in Angle to Key WestTagged Angle to Key West, big water, Lake Huron, waves, windBookmark the permalink. Everyday you take me there. You’ve mastered the worst of the maze — this is “just” island hopping. But the trees are all wrong for Frank and Junior.